What can be more fun than having a glass of champagne in the morning of the wedding day and being surrounded by your best friends? After we finished photographing the groom preparation, we headed to the bride's house. There, the girls were having their hair and makeup done. Once they finish that, the bride in the bridal party went to the backyard. The girls giggled, danced and after a while, the beautiful bride went inside the house and brought a cold bottle of champagne. When the bridesmaids saw it, they erupted in laughters. This wedding photo captures the moment when the bride opened the bottle of champagne. She is position on the left of the frame while the bridesmaids, on her left, are screaming. 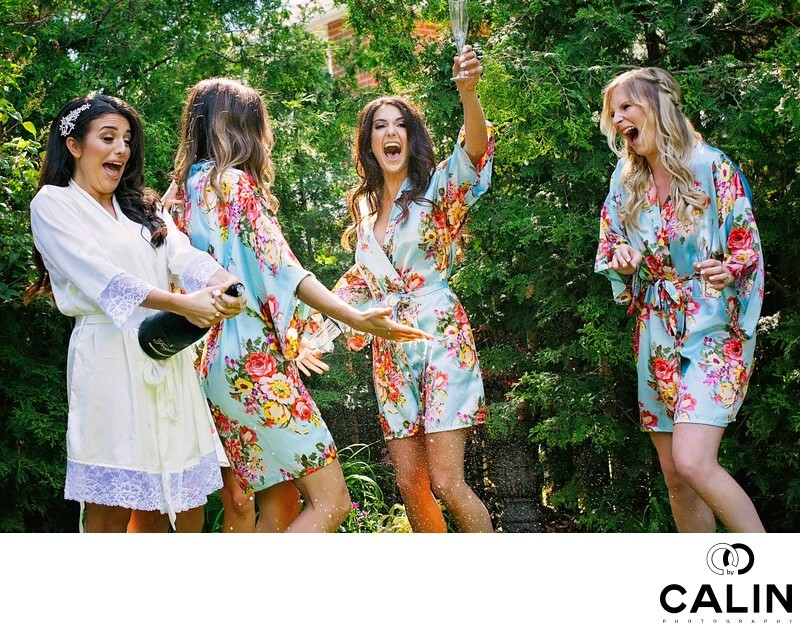 The beauty of this candid photo is that captures the champagne drops, the bride and the girls screaming and jumping in mid air. Because I photograph this image on a summer day, I had enough light to use a fast shutter speed to freeze the subjects' motion. This is a back-lighting scenario where the main light is placed behind the girls and bounced into the house so it provides enough light to illuminate the subjects. This sandwich of light makes the girls' skin glow and illuminates the champagne droplets, creating a fairy-tale like look. The shot use a balanced composition of repeating patterns (the bridesmaids wearing identical robes). The only one breaking the pattern is the bride wears a white robe, which identifies her as the main subject in this photo. After the bride's preparation we headed to the groom's house for the first look and is to a park where we took pictures of the bridal party and the bride and groom. Immediately after that, we headed to Château Le Parc in Vaughan for the wedding ceremony, followed by the cocktail hour and reception. I highly recommend this beautiful wedding venue for the bride and groom looking for a classy event space.